Definition: Economics is that branch of social science which is concerned with the study of how individuals, households, firms, industries and government take decision relating to the allocation of limited resources to productive uses, so as to derive maximum gain or satisfaction. Simply put, it is all about the choices we make concerning the use of scarce resources that have alternative uses, with the aim of satisfying our most pressing infinite wants and distribute it among ourselves. Economics is a science: Science is an organised branch of knowledge, that analyses cause and effect relationship between economic agents. Further, economics helps in integrating various sciences such as mathematics, statistics, etc. to identify the relationship between price, demand, supply and other economic factors. Positive Economics: A positive science is one that studies the relationship between two variables but does not give any value judgment, i.e. it states ‘what is’. It deals with the facts about the entire economy. Normative Economics: As a normative science, economics passes value judgement, i.e. ‘what ought to be’. It is concerned with economic goals and policies to attain these goals. Economics is an art: Art is a discipline that expresses the way things are to be done, so as to achieve the desired end. Economics has various branches like production, distribution, consumption and economics, that provide general rules and laws that are capable of solving different problems of the society. Therefore, economics is considered as science as well as art, i.e. science in terms of its methodology and arts as in application. Hence, economics is concerned with both theoretical and practical aspects of the economic problems which we encounter in our day to day life. Micro Economics: The part of economics whose subject matter of study is individual units, i.e. a consumer, a household, a firm, an industry, etc. It analyses the way in which the decisions are taken by the economic agents, concerning the allocation of the resources that are limited in nature. It studies consumer behaviour, product pricing, firm’s behaviour. Factor pricing, etc. Macro Economics: It is that branch of economics which studies the entire economy, instead of individual units, i.e. level of output, total investment, total savings, total consumption, etc. Basically, it is the study of aggregates and averages. It analyses the economic environment as a whole, wherein the firms, consumers, households, and governments make decisions. It covers areas like national income, general price level, the balance of trade and balance of payment, level of employment, level of savings and investment. The fundamental difference between micro and macro economics lies in the scale of study. Further, in micro economics, more importance is given to determination of price, whereas macroeconomics is concerned with the determination of income of the economy as a whole. 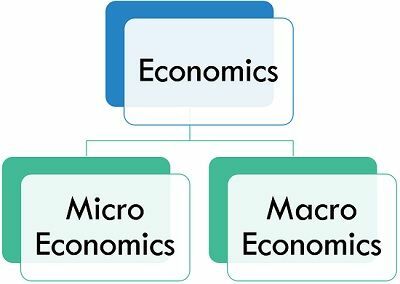 Nevertheless, microeconomics and macroeconomics are complementary to one another, as they both aimed at maximising the welfare of the economy as a whole. From the standpoint of microeconomics, the objective can be achieved through the best possible allocation of the scarce resources. Conversely, if we talk about macroeconomics, this goal can be attained through the effective use of the resources of the economy. Thank you very much sir .Because your language is fully understandable .